MADISON, Wis., September 27, 2018 – iCombat is a tactical laser tag company created for adults. 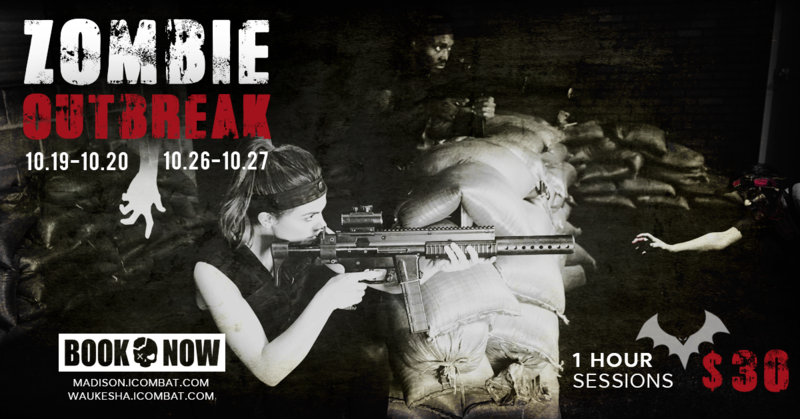 They will be hosting their 4th annual Zombie Outbreak Laser Tag Event this October. A horde of zombies has taken over a secret military base in Fitchburg but the government won’t acknowledge their existence so iCOMBAT Madison is recruiting citizen-soldier sweep teams to prowl through the darkened facility to destroy the zombies and take back the base. The technology wizards at iCOMBAT have invented a new system that allows real-life actors in zombie costumes to “attack” two sweep teams of tactical laser tag players. If a zombie emerges from the darkened battlefield and can get within five feet of a player, the player will be dead. The players can only stop the zombies’ advances temporarily by shooting them – but a few seconds later the zombies will begin their attacks again. All of this action occurs during the usual tactical laser tag battles between two teams of players on a Hollywood style movie set of a US military base. The special Zombie Hunt sessions at iCOMBAT Madison will be featured on Friday and Saturday evenings from October 19th to October 27th, beginning after 5pm. The sessions will be 60 minutes long and cost $30. Reservations are encouraged and can be made at barracks.icombat.com, or by calling 855-454-4426. Due to the intense action, players must 13 years or older. iCOMBAT’s patented technology is so realistic that it is used for training by SWAT teams and Special Forces units around the world. The 16,000 square foot iCOMBAT Madison facility is modeled after Camp Leatherneck, the U. S. military base in Helmand, Afghanistan. It features guard towers, a sniper’s nest, real military vehicles, multiple exploding props, and one and two story buildings on a fully immersive field with a 27, 000 watt sound system. Participants will hear helicopters hovering overhead and jets screaming by during an action-packed session with multiple missions. There is a VIP area for observers to watch the competition. Scores and live footage of the missions will also be shown in the lobby on large television screens. iCOMBAT Madison is located at 2919 Marketplace Drive in Fitchburg near the intersection of County Road PD (McKee Road) and Seminole Highway close to Breakaway Sports Center. More information about iCOMBAT can be found on their Facebook page at facebook.com/iCombatMadison or on their website Madison.icombat.com. Last year, more than 250,000 people hunted for zombies using iCOMBAT’s Zombie Apocalypse technology at dozens of facilities around the world.